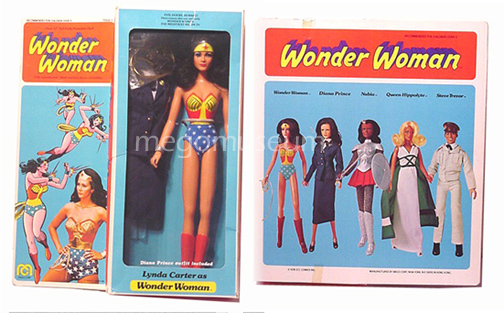 In 1977,Mego released the first 4 Wonder Woman figures. 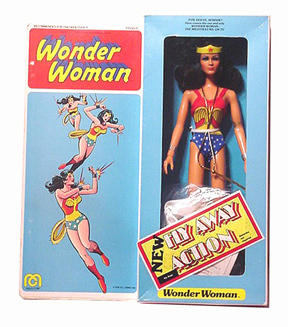 The box on all 4 figures features Lynda Carter’s picture from the first season of the TV show. The back of the box features prototype versions of each of the 4 dolls. The first release WW has painted on outfit with blue fabric star shorts. 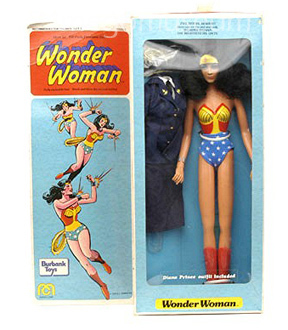 Comes with Diana Prince navy uniform, dark tinted glasses, black shoes, magic lasso, bracelets, red boots, tiara, and blue stand. Linda Carter was absent from the 2nd Release Wonder Woman It’s unkonown whether Mego had the rights to use her likeness at all. When producing figures for the Superman Movie, it was obvious Mego could not use the characters likeness or their movie outfits. Wonder Woman gets a new look! 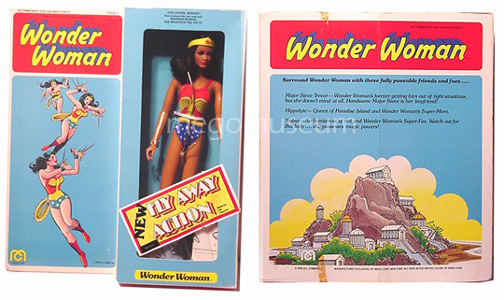 Mego redesigned the box back to just a picturesque artist’s rendering of Paradise Island with text advertising for you to “surround Wonder Woman with other friends & foes”(i.e. the other dolls in the line). On the front, they still used the same comic book drawings but no Linda Carter photos. 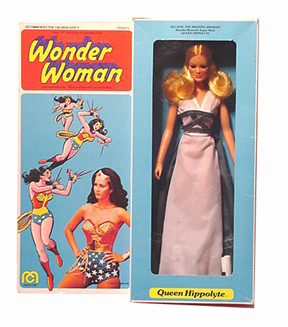 The Wonder Woman doll no longer had the painted on outfit, but came with a completely removable cloth outfit with straps. 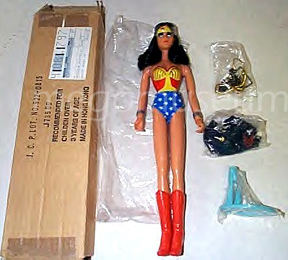 She also came with 2 new Diana Prince outfits. The one that was always included is a blue robe that tied in the front and a pair of shoes. 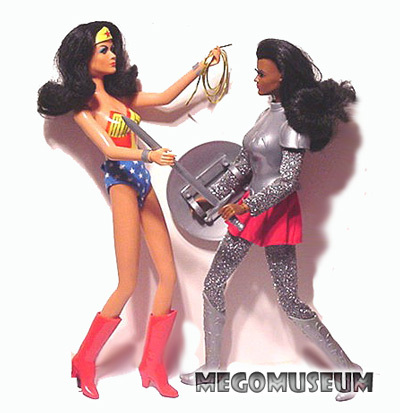 This is the one photographed in the 1979 Mego Toy Fair Catalog. The other outfit, which varied, was usually Cher’s salmon colored halter dress that snapped behind the neck (probably because Mego made so many of them). But sometimes included was Farrah’s white one-piece halter jumpsuit, which also snapped behind the neck. The shoe colors usually varied between, white, salmon, or black. Another variation is Cher’s “Fortune Teller” outfit designed by Bob Mackie. Again, from a production standpoint, this made sense due to the amount of outfits Mego probably owned from the popularity of their Cher and Farrah lines (sidenote: Mego repackaged most of Bob Mackie’s Cher outfits into Farrah’s outfits either due to demand on Farrah’s products or due to an excess of inventory. Farrah was never really THAT glamorous anyway). 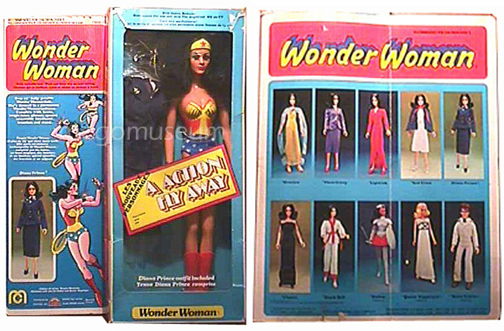 Also, Wonder Woman began to slip in it’s own popularity on TV at this time and Mego probably couldn’t see investing any more money into the line, so they added whatever excess outfits they had in order to move the inventory. Here is a Canadian “Grand Toys” box, that features the Canadian released outfits. The UK’s Burbank Toys box, not shown here are the Mexican Lili Ledy and Canada’s Parkdale Novelty Box. 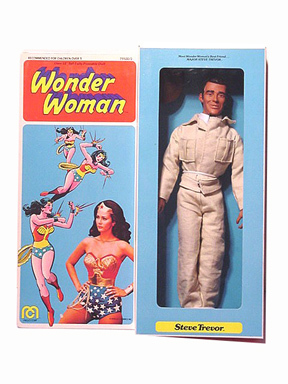 Steve Trevor Wonder Woman’s boyfriend usually had Blond Hair in the comics, here the figure is a mix of the comic characters outfit with a likeness of Lyle Waggoner. 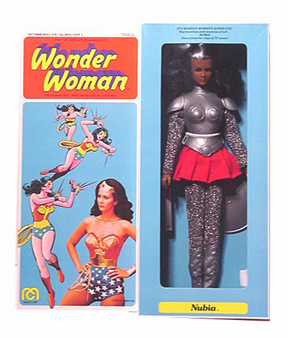 NubiaShe was never featured on TV, only in the comic book series as Wonder Woman’s long-lost Amazon sister. 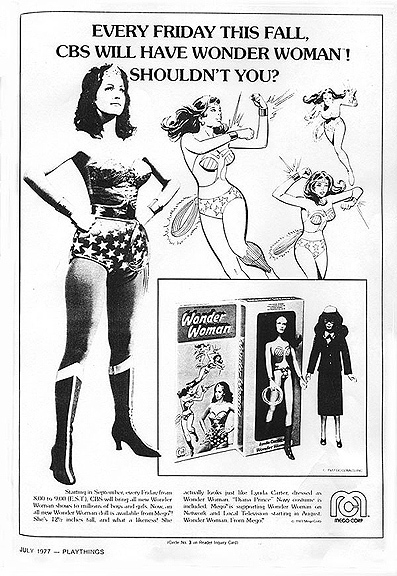 The doll’s box claimed she was “direct from her reign of TV terror” and she was marketed as Wonder Woman’s “super-foe”. Hippolyte Doll has white gown with green cape and gold buckles on each shoulder and is wearing white shoes. Also comes with white stand. The doll was modeled after actress Cloris Leachman. of the comic characters outfit with a likeness of Lyle Waggoner.